Jeremy Treglown wants to debunk the notion—commonly-held, he says, by U.S. academics and Spanish Republican exiles in particular—that Spanish culture under Francisco Franco was a wasteland. In Franco’s Crypt: Spanish Culture and Memory since 1936, he creates a counter history to the counter history: instead of debunking the myths Franco created around himself, Treglown goes after the debunkers of that mythology. In lively prose, he scours Spanish culture from the 1940s to the present day, reminding the reader of important monuments, films, novels, and works of art created by Spaniards living under Franco’s dictatorship. Although Treglown recognizes the intellectual drain caused by the Civil War and the injustices of the Franco regime, he makes the seductive argument that the work of artists and writers has been summarily and unfairly ignored. “Cultural memory,” Treglown observes, “has no point if it recuperates only half the past.” Unfortunately, like the Falange’s yoke and arrows that appears on the book’s spine, some of the author’s reasoning muddles his attempt at a more balanced look at Spanish artistic creations during the past 70 years. Aficionados of contemporary Spain will find a vivid survey of Spanish history and culture in Treglown’s book. A British journalist and academic, he delves into both popular and obscure Spanish novels, artwork, and films, identifying as much material as possible available in English translation. 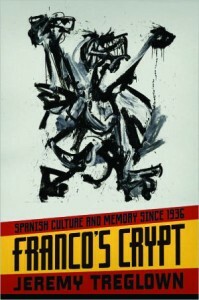 His years as a regular visitor to the Iberian Peninsula are evident in his long-view discussion of the current state of the recuperation of historical memory: he watches as the graves of Spanish Republicans are disinterred in far-flung municipalities, talks to the curators of Spanish museums dedicated to commemorating the Spanish Civil War, and screens dictatorship-era Spanish films that were never widely seen outside the country (or inside it, as it turns out). Treglown provides an engaging view of influential postwar Spanish historians, novelists, and filmmakers. With the benefit of hindsight, he sets these writers and directors into a historical and cultural context, laying out the obstacles they encountered and the effects they had in shaping the debates in dictatorship and democratic Spain. Although some of these artists and writers were considered friends of the Franco regime—the novelist Camilo José Cela worked as a censor, while the director Luis García Berlanga supported the Nazis by fighting with Franco’s Blue Division during World War II—many more were attempting to fly under the dictator’s radar, releasing books and films under the heavy scrutiny and limitations of Franco’s government. Of course novels are not the same as politics, and 1978 was not the same as 1948. Treglown has a tendency to conflate novelists—Franco supporters and exiled Republicans alike—who were able to practice free expression with (nonexistent) political freedoms. Yes, novelists could write and publish works of literature that merited academic study and an international audience inside dictatorship Spain, although curtailed by censorship or the distance imposed by exile (Luis Martín-Santos’ Tiempo de silencio, Carmen Laforet’s Nada, and Ramon J. Sender’s Réquiem por un campesino español are only a few of many examples). These works challenged, in one way or another, the regime’s stranglehold on Spanish culture. But were they evidence of a dictatorship that was somehow not as oppressive as historians and witnesses have made it seem? “Our backward glance always flattens the landscape,” Treglown says, thinking of the way we simplify the events of the past: “clearly any notion that Franco’s Spain was an artistic desert is the opposite of the truth.” His book draws attention to that “flattened landscape,” which includes some of the public works projects Franco undertook. One such project—The Valley of the Fallen, a monumental work of Francoist propaganda completed by Republican prisoners of war in the late 1950s—still stands on a mountainside outside Madrid. Treglown attended services in the monument’s basilica in 2006 alongside an incongruous congregation of local elderly citizens and neo-Falangists in their blue uniforms. Even the landscape of this seemingly immobile granite cross has changed: meant to memorialize Franco’s fallen soldiers in the Civil War, the monument is now a giant reminder of Spain’s continued struggles to untangle its divided past and remember the casualties on both sides of the war. This, ultimately, is Treglown’s intention as well. Franco’s Crypt presents the debates and dialogues, culture and memory from both sides that lie beneath Spain’s complicated 20th century history. As the author demonstrates, these debates are ongoing in the pages of recent historical novels by Javier Marías, Almudena Grandes and Javier Cercas, and onscreen in the films of Carlos Saura, Guillermo del Toro and even, in his way, Pedro Almodóvar. Once Franco’s metaphorical crypt was opened, there has been no holding back the torrent of debate over Spain’s historical memory that followed. Sara J. Brenneis is Associate Professor of Spanish at Amherst College and author of Genre Fusion: A New Approach to History, Fiction, and Memory in Contemporary Spain (Purdue University Press, 2013).